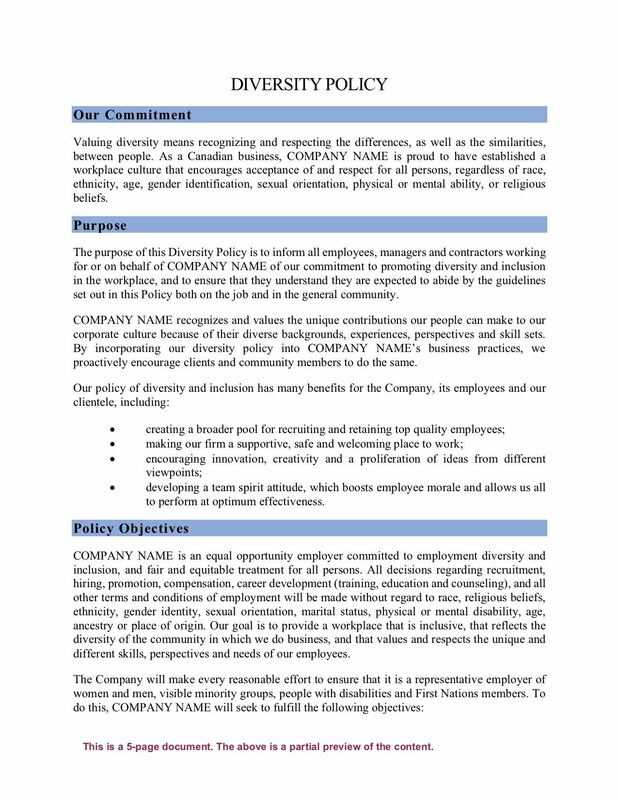 Prepare a Diversity Policy for your business with this customizable template for Canadian companies. The policy statement sets out the company's commitment to establishing a corporate culture that promotes diversity and inclusion in recruitment, training, incentive programs, performance management, product development, community involvement and all other aspects of the corporate operations. 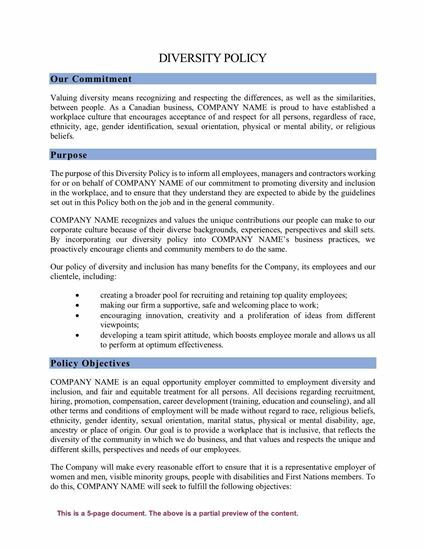 The policy also specifies the company's specific objectives with respect to hiring and retaining high quality employees regardless of race, religious beliefs, ethnicity, cultural background, gender identity, sexual orientation, age, physical or mental challenges, ancestry, or place of origin. hiring and retaining employees in key positions who represent the diversity of the community at large. Although this Diversity Policy is intended for use in Canada, it can be easily modified to use in any country by replacing the specific references to Canadian laws and regulations. Download the form immediately after purchase. Available as a MS Word template. 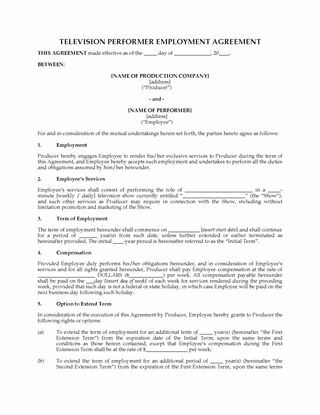 Use this Television Performer Employment Contract to hire actors and musicians for a TV series or program. The term of employment is for a specified period of time, which can be extended if both parties agree in writing. The performer will be paid a regular salary (the payment period in the template is weekly). The producer will supply transportation, meals and accommodation for any required location shooting. The producer has the right to suspend production if the performer fails, refuses or is unable to perform, or if the performer materially breaches the agreement, or if circumstances beyond the producer's control hamper production. The performer must maintain membership in good standing in his or her appropriate guild â„ union during the term of employment. Standard form contracts save you time and money, so it makes sense to download the Television Performer Employment Contract and add it to your contract portfolio. mandatory drug and alcohol testing upon reasonable suspicion. It's easy to write a Substance Abuse Policy with this customizable digital template. Download yours now. Employers, prepare an Employee Tardiness and Absenteeism Policy Statement for your company with this ready-made template. a method for employees to redeem past occurrences of lateness or absence. The Tardiness and Absenteeism Policy Statement form is provided in MS Word format, and is fully editable to meet your particular needs. Write a Franchise Agreement for a franchise business in Canada using this comprehensive template. This is a standard form legal agreement which includes a Guarantee, Indemnification and Acknowledgement form to be completed by the Franchisee. The document contains clauses covering the initial term and renewal terms, initial franchise fee, and continuing fees to be paid by the franchisee. The franchisor is responsible for providing the franchisee with training, support and access to its purchasing programs. The franchisee is responsible for being open for business and operating the franchise in accordance with the franchisor's business model. Provisions for confidentiality, protection of the franchisor's trade marks and other intellectual property. The franchisee is obligated to participate in the franchisor's advertising and promotional programs. This Canada Franchise Agreement template is provided in MS Word format, and is fully editable to fit your business needs. Canadian franchise laws require franchisors to provide potential franchisees with this Franchise Disclosure Document. Buy and download the Canada Franchise Disclosure Document, complete it and include it in your franchisee application package. Prepare an Employee Disciplinary Rules and Procedure Memorandum for your company with this easy-to-use template. the employee's right to appeal. This Employee Disciplinary Rules and Procedure Memorandum is provided in MS Word format, and can be easily edited to fit your specific circumstances. Ontario employers, prepare an Employee Policy Statement for your business with this comprehensive easy-to-use template. This Ontario Employee Policy Statement form is provided in MS Word format, and is fully editable to meet your particular needs.